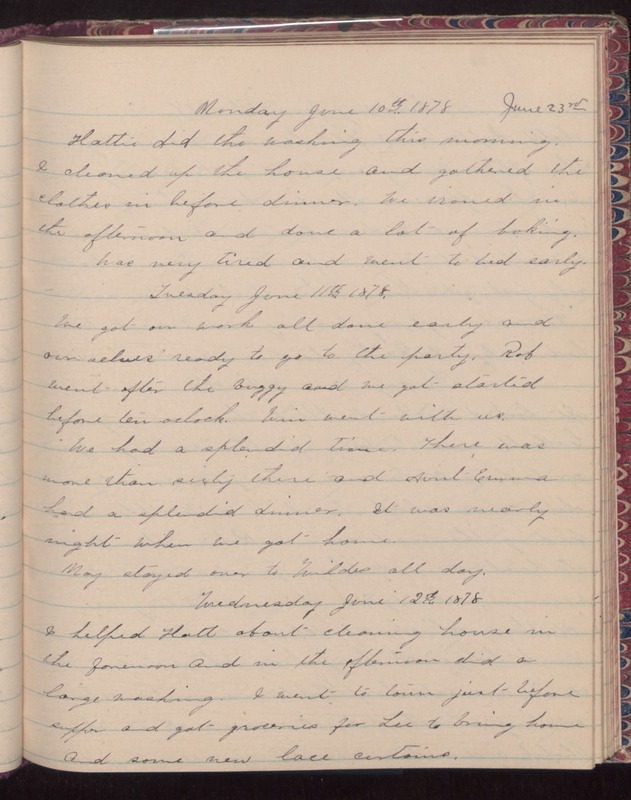 Monday June 10th 1878 June 23rd Hattie did the washing this morning. I cleaned up the house and gathered the clothes in before dinner. We ironed in the afternoon and done a lot of baking. Was very tied and went to bed early. Tuesday June 11th 1878 We got our work all done early and ourselves ready to go to the party. Rob went after the buggy and we got started before ten oclock. Win went with us. We had a splendid time. There was more than sixty there and Aunt Emma had a splendid dinner. It was nearly night when we got home. May stayed over to Wildes all day. Wednesday June 12th 1878 I helped Hatt about cleaning house in the forenoon and in the afternoon did a large washing. I went to town just before supper and got groceries for Lee to bring home and some new lace curtains.